Home Magic: The Gathering MTG Card of the Day Very Cryptic Command – MTG COTD – All 6 versions! Very Cryptic Command – MTG COTD – All 6 versions! 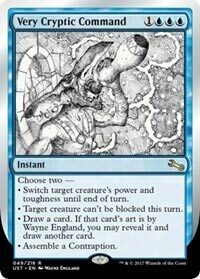 What we initially thought was Cryptic Command 2.0 with goofy art turned out to be something much, much, much, much more. Today we are reviewing six cards…. sort of. I feel like the inception of Very Cryptic Command is due to the full art promo of Cryptic Command. This resulted in much confusion as even seasoned players would forget all four abilities. I’m going to refer to the cards from A-F, the same way they are designated on the WotC page. All versions share the same mana cost as the original Cryptic Command, which is going to impact its limited score. The most notable difference with this card is the art by Wayne England, who unfortunately passed away before finishing it. I wouldn’t mind seeing more “prototype” card art on promos. The last two abilities make this the most silvered bordered of the 6. As mentioned previously, I love artist decks so tempting players to build a Wayne England deck is a nice send off to his legacy. Lastly you can never have too many Contraptions, especially if you’re playing Widget. This card could be black border if it wasn’t for the second mode. The discard ability is more red than blue, which is a nit-pick. The last ability is the one I like. Considering you can target another VCC (B) you can continually re-cast them. Now we are talking. The first ability is exciting until you realize you still have to cast the card you draw. With all islands you need to cast VCC (C) let’s hope one of your opponents is playing blue. Twin cast is good, but assuming you have the mana or means you can target another VCC (C) to get infinite Gnomes. I like it when two modes have synergy. By using the third and fourth ability you can essentially (albeit very expensively) kill an attacking creature in a very Blue way. 1-3 are standard Blue tricks, the first of which is from the original Cryptic Command. The last ability though makes me giddy. Being able to get two morph triggers from Voidmage Apprentice among others is enticing. The more practical application for this ability though is to turn a board threat such as say Ulamog into a puny 2/2 with no abilities. The first ability is fun, but useless in limited. The second ability is underwhelming considering (D) can target any permanent. The funny thing is that modes three and four both work really well in limited and combos nicely with Socketed Sprocketer. Remember that in limited players often use 40 card decks, making milling a viable strategy. Scry 3 is pretty potent. Creating a black creature token doesn’t feel right for a spell that requires three islands. The number ability is zany and has so many applications that its impossible to list them. Although in limited to will mostly be messing with dice rolls in unlimited you can enjoy increasing an eldrazi’s Annihilator number. Finally the fourth ability is hit or miss, good thing you don’t have to always pick it. This is essentially a Contraption board wipe in limited. Let’s start with the fun of Very Cryptic Command: there are six unique versions of Very Cryptic Command, each with their own unique list of effects. They all share a name (and are subject to the card limit rules), most of them have the same artwork, and they share the mana cost of Cryptic Command, but they (obviously) don’t play identically. So, let’s touch on each of the six! Version 1-Untap two target permanents. -Tap each permanent target player controls with exactly one word in its name. -Discard all the cards in your hand, then draw that many cards. -Return target instant or sorcery card from your graveyard to your hand. The power of this version lies in its second mode, because it turns out that basic lands are, indeed, permanents with one-word names, so you can effectively Time Walk someone by popping this on their upkeep. The other modes are pretty nice utility and can help you to ensure that you hold the advantage; Windfall is a nice effect, Call to Mind lets you get back potentially another copy of this Very Cryptic Command, and untapping permanents can mitigate the cost of this card. It scores highly in terms of its raw power, but be wary of everyone hating you for this. -Switch target creature’s power and toughness until end of turn. -Target creature can’t be blocked this turn. -Draw a card. If that card’s art if by Wayne England, you may reveal it and draw another card. The one different art of the sextet, an homage to the late Wayne England (who did the original Cryptic Command, and did a sketch for Very Cryptic Command before his passing). The power level of each mode is a bit lower, though tacking a cantrip that potentially becomes a double cantrip onto them makes it a good bit stronger. And, if you need to, you can use it to go for a game-ending strike. -Draw a card from target opponent’s library. -Copy target instant or sorcery spell. You may choose new targets for this copy. -Until end of turn, target creature loses all abilities and becomes a blue Frog with base power and toughness 1/1. -Create a 1/1 colorless Gnome artifact creature token. Drawing a card from an opponent’s library is usually worse than it sounds, honestly, since it offers no guarantee that you’ll get a playable card. It gets better the more colors you run…though triple blue makes this card a hard splash. In conjunction with the other modes, though, it’s more reasonable, as a pseudo-cantrip onto Twincast, Turn to Frog, or token generation is justifiable enough. None of the modes here are absurdly powerful, but being able to flex this with two strong modes (Turn to Frog and Twincast) makes this a good bit of role compression. -Return target permanent to its owner’s hand. -Draw two cards, then discard a card. -Change the target of a spell with a single target. -Turn over target nontoken creature. Of the six variants of this card, this is the closest one to being black-bordered in how it functions. Even the fourth mode: it’s a bit of a reworded version of Ixidron’s ability, and it has the added bonus of playing nicely with transform creatures. You can flip them into their weaker side (or stronger side, if you’ll benefit), or you otherwise turn them into a vanilla 2/2. Misdirection and Boomerang are both powerful, as is the draw effect. It’s probably the least flashy of the six, but it plays closest to a black-bordered version of a spell, and being able to neuter two troublesome permanents is a lovely option. -Return target creature to its owner’s hand. -Untap each permanent you control with a watermark. -Roll two six-sided dice. Target player puts the top X cards of his or her library into his or her graveyard, where X is the sum of the results. This version is very “silver” in its play. The third mode is potentially powerful if you love watermarks (remember: FNM stamps and judge foil stamps are watermarks), and there are a lot of blocks this plays well with (Ravnica, Return to Ravnica, Scars of Mirrodin, and Tarkir are the ones that immediately come to mind), and coupling an Unsummon with a mass-untap effect is nice. The first mode is clearly better in Commander and Casual formats, as the odds of you getting to counter a black-bordered spell in Unstable are pretty low. The mill effect is…not particularly efficient, so you’d only do this if you’re in a hard-core mill deck or have nothing better to do. You’ll average a mill of 7, which is Mind Sculpt’s strength, so don’t count on this to be a weaker Archive Trap in your Mill.dec anytime soon. -Create a 2/2 black Rogue creature token with menace. -Add or subtract 1 or one from a number or number word on target spell or permanent until end of turn. -Return all artifacts target player controls to their owner’s hand. Besides Version 1, this might be the strongest variant of Very Cryptic Command, partially thanks to it serving as an unlikely kill spell for X/1 creatures (remember, that 1 in their toughness is, indeed, a valid target for this spell). Scry 3 is a nice rider onto a Hurkyl’s Recall (and it helps that Contraptions are artifacts), and a token with menace can help you out if your board is empty. Nothing is extremely powerful here, but it also depends the least on interacting with the board, making it a safe “blind” spell to run. Unstable‘s concept of variant versions under the same card name is absolutely ingenious. It’s based on the practice from some early sets, notably Fallen Empires, Homelands, and Alliances, where some cards had up to four alternate illustrations. You could have each copy in your deck have different art, or pick the one you liked and go with that to differentiate it from your friend’s deck. It was discontinued because Wizards felt that some players relied on having consistent art to recognize the cards, but if you happen to be playing with those cards now, you can enjoy it. You can also do much the same thing with Unstable‘s alternate versions. It turns a very basic constant of Magic – the idea that a card’s identity, and by implication its effect, is determined by its name – upside down, and if these could show up in tournaments, it’d be an absolute nightmare for deck checks and the like. Good thing that Unstable isn’t for tournament play, then! We’ve included images of all six on this page, and the “default” one that showed up in the spoiler list is at the top. Let’s get nuts! Version A has the most outwardly hilarious art and is a poignant reminder of the late Wayne England’s long career as a Magic illustrator. It’s an eclectic mix of effects that arguably don’t go together as well as the card it pays homage to, but switching a creature’s power and toughness and unblockability have some offensive versatility. 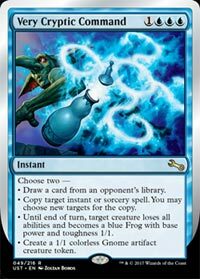 The former has a pedigree in killing Walls, and synergy with the second in the context of blue’s high-toughness creatures. The second two also add a degree of card advantage that can be potentially crazy: a Wayne England theme deck will obviously always choose the third ability in most situations, and Contraptions add up to a lot of basically “free” effects over time. Being more or less half offense and half attrition is a little unusual, but we’ve seen the principles combined before in decks like Delver (what’s the un-set version of that deck?). Version B is highly reminiscent of the original Cryptic Command as a very powerful tempo tool. It’s true that many creatures have names with two or more words – the second ability would be especially insanely underpowered in Kamigawa – but lands are pretty vulnerable. Basics are the obvious target, but watch out for times when you can stop a Mutavault or Swarmyard with it, too. The Wheel of Fortune effect and the graveyard-recurring effect aren’t as outwardly tempting as simply drawing a card, but they set up your future plays just as effectively as the black-bordered Cryptic Command. Version C is also surprisingly like a lot of black-bordered cards, except for drawing from someone else’s library. I remember the Fourth Edition introductory rulebook mentioning that some players use glass stones or sticky notes to mark cards of theirs that have to be played in the opponent’s territory. Would that work for when your opponent draws one of your cards? Is it considered having unfair information about their hand? What if you’re playing with different colored sleeves? Maybe it’s a good thing this isn’t a black-bordered card – the arguments about things like that would completely overshadow the actual game! Again, not all of the abilities have complete synergy with each other – apart from the obvious ability to turn a large attacker into a 1/1 creature and block it with a Gnome – but they’re generally pretty tempting in themselves. Copying spells can undo an opponent’s advantage and win counterspell battles, and is pretty hilarious in setting where people sling things like Warp World. I’d be wary of relying too much on drawing a card from someone else’s deck; it’s perhaps better in larger games where there’s a higher natural chance of someone else playing blue, but you’d hate to end up with something like Arbor Colossus or Akroma. Version D is also surprisingly like a black-bordered spell in certain ways; as James explains on this same page, the fourth ability is actually a variant of Ixidron from Time Spiral. I especially like that it works on werewolves and other similar Innistrad creatures, though I’m not sure exactly how it interacts with meld creatures (and augment creatures, for that matter). It seems like the melded creature is one creature made of two physical cards, so you turn over both of them, but I wouldn’t necessarily quote me on that. I think the main event, so to speak, may be this version’s effectiveness against spell-heavy decks. A Deflection effect can be devastating when used properly – think of spells like Mind Shatter and Bribery – and combining it with the draw-and-discard effect can put you very far ahead indeed. Version E makes me smile because it clearly stakes out a lot of silver-bordered design space. For some reason, I think I’d feel unusually good countering a card like Jace the Mind Sculptor with it. I know that you can counter a card like that just as easily (if not more so) with black-bordered spells like Negate or Spell Pierce, but there’s something different about saying “you are not going to enter this game right now because you are a staple of tournament Magic”. I also want to explore what you can do with the watermark ability; I’m not aware of any basic lands with watermarks, so you can’t really go infinite, but it definitely applies to Signets, and to the more recent versions of mana-generating Myr. It might even be a good card for dice-rolling decks in Filth Casserole with silver-bordered cards, as it’s the same color as Chicken a la King, but dice-rolling effects are in multiple colors and it requires some caution with the mana. Version F is also surprisingly black-bordered in its way. I could almost see them experimenting with the “add or subtract” ability in black-bordered sets, but it would undoubtedly cause memory issues and disputes. I am intrigued with how it lets you mess with planeswalkers. Not only can you change the dynamic of your own planeswalkers’ loyalty abilities by, say, making their ultimates come online one turn earlier, you can change your opponent’s planeswalkers so that a formerly neutral ability now counts down and either shortens their time on the field or changes the required pattern of use. The creature it creates is more of a threat than Version C, and scrying is always a great add-on in my book. After all, it’s basically a legal way to stack your deck . . .
See you next week, and I hope to see all of you playing with at least one of these versions!